A commemorative plate at the place where the assassination attempt happened. It reads: (Assassination) attempt on Rudy Dutschke. 11th April 1968. Dutschke died in 1979 as consequence of the injuries of the shooting. The student movement lost one of their most brilliant people. 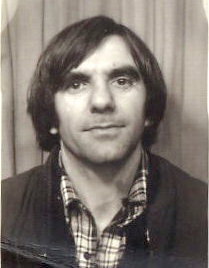 Rudi Dutschke born Alfred Willi Rudi Dutschke (March 7, 1940 – December 24, 1979, Århus, Denmark) was a spokesperson of the left-wing German student movement of the 1960s. He famously split from those who went on to form the violent Red Army Faction. Instead he wanted to have 'a long march through the institutions' of power to create radical change from within government and society by becoming an important part of the machinery. This was an idea he took up from Antonio Gramsci and the Frankfurt school of Cultural Marxism. In 1968, he survived an assassination attempt which seriously injured him. He had to re-learn how to speak altogether. Because of this attempt, he developed epilepsy. He drowned in his bath tub 12 years later. This was caused by an epileptic seizure. ↑ "The Limits of Violence". ↑ "Gramsci: A Method to the Madness". The Midnight Sun. This page was last changed on 9 March 2015, at 06:31.